Encompass New Opera Theatre commissioned and developed The Theory of Everything, a new full-length opera exploring science, spirituality and indigenous cosmology. The opera traces the journey of a Brazilian quantum physicist who is studying fundamental connections between science and the ancient wisdom of the Q'ero Tribe in Peru. Alternating between North and South America, scenes take place inside a planetarium and at the University of Sao Paulo in Brazil, where Tomás Cabral teaches physics. Raised in the Amazon, his innovative approach prepares his students to be scientists for change. His wife, Rachel, a documentary filmmaker, is exploring near-death experiences, and their daughter Cassy is a precocious ten-year-old student of astronomy. Dramatic events involving the family catapult a metaphysical and scientific search into other dimensions and alternative universes. The final scene takes place in the village of the Q'ero Elders, 19,000 feet high in the Andes Mountains in Peru. JOHN DAVID EARNEST (composer) has written extensively for orchestras, chamber ensembles, chorus, solo voice and opera. He writes, "In my conversations with Nancy, I was immediately drawn to her concept of exploring the connection between spirituality and the physical world. In order to find a musical voice for these themes and Nancy's libretto, I have chosen several eclectic sources ranging from tonally based melodic ideas to non-traditional musical structure and vocabulary." NANCY RHODES (librettist-director) is the artistic director of Encompass New Opera Theatre. She writes, "In 1987, I read an article in The New York Times about an astounding new physics theory postulating the simultaneous existence of at least ten dimensions, known as superstring theory. Pushing the envelope of the mind to embrace multiple dimensions, sister universes, and the possibility that everything from our bodies to the farthest star, is made up of vibrating strings, fascinated me... I read metaphysical literature, Eastern philosophy, science, and poetry... Further research led me to the writings of physicist David Bohm and his ideas of a holographic universe, to Native American spiritual conferences, healing seminars, and the laboratories of physicists at Columbia, CUNY, and Princeton." Development of The Theory of Everything was made possible with public funds from The National Endowment for the Arts, Access to Artistic Excellence in 2006 and 2009, and New York State Council on the Arts with the support of Governor Andrew Cuomo and the New York State Legislature. The Theory of Everything received commissioning support from OPERA America's Opera Fund, launched by the NEA (funded by the Helen F. Whitaker Fund, The Andrew W. Mellon Foundation, The Canada Council for the Arts, The William and Flora Hewlett Foundation, The James S. and John L. Knight Foundation, and The George Cedric Metcalf Charitable Foundation). Encompass is grateful for commissioning funds from the Mary Flagler Cary Charitable Trust's Program for Contemporary Music Projects. Concert readings of The Theory of Everything were sponsored by the Science & Art Series, CUNY. 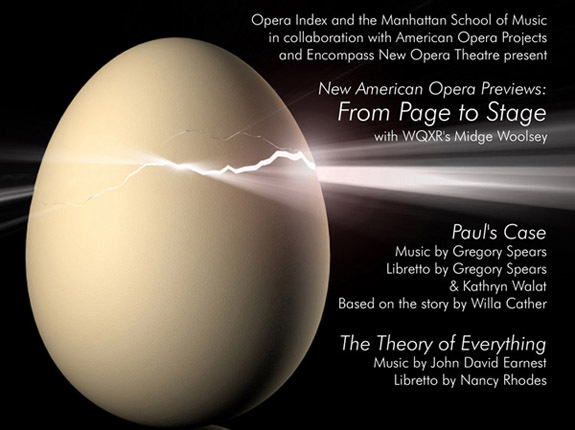 Encompass performed scenes from The Theory of Everything at Symphony Space, New York City Opera's VOX: On the Edge program, New American Opera Previews: From Page to Stage, and Opera America's New Composers Forum.